Educator and parent Crystal Sousa and retired schools technology support specialist Regina “Reggie” Gomes were elected this week to the Denair Unified School District Board of Trustees. In results released Tuesday night, Sousa received 382 votes (36.17%), Gomes 290 (27.46%), retired Denair Middle School custodian Charlie Asbill 234 (22.16%) and self-employed businesswoman Tina Gresio 144 (13.64%). Sousa and Gomes will be sworn in at the Dec. 14 board meeting. They will replace Trustees Sandi Dirkse and Robert Hodges, who did not seek re-election. The new board members will serve an extra year – until 2022 — thanks to a decision by the current board last month to move trustee elections from November in odd years to November in even years. The move is consistent with the state’s preference to consolidate local elections with statewide voting already scheduled for even years. There is abundant data that shows voter turnout is much higher in even year, when people have more issues and candidates to consider. The next time that voters in the Denair district will elect trustees is 2020, when the terms expire for the other three trustees – Kathi Filson, Ray Prock Jr. and John Plett. There will be two vacancies on the Denair Unified School District Board of Trustees for voters to fill in the November election. Prospective candidates are invited to a forum Thursday, Aug. 10 that will be occur at the end of the board’s regularly scheduled monthly meeting. The meeting begins at 7 p.m. in the district board room, 3460 Lester Road. Trustees Sandi Dirkse and Robert Hodges already have announced they will not seek re-election. Two years remain on the terms of the three other board members – Kathi Dunham-Filson, John Plett and Ray Prock Jr. Prospective candidates for the Nov. 7 election have until Thursday, Aug. 16 to file their paperwork with the Stanislaus County Office of Elections. Trustees meet monthly and help set policy for the 1,300-student district, which includes four campuses. There isn’t much that Carolyn Brown hasn’t experienced in 28 years on the Denair Unified School District school board. Academic achievement, the passage of two bonds to build beautiful new facilities and the restoration of community pride. Controversies over the American flag, near bankruptcy and two attempts to redraw the district’s boundaries. Six superintendents, two interim superintendents and at least 22 other board members. Through it all, the one constant has been Brown, who began her tenure on Denair board as the mother of two elementary-age daughters in 1987 and leaves as the grandmother of five. Thursday night was her final meeting after deciding not to seek an eighth four-year term. Her colleagues presented her with a clock, marveled at her institutional memory and praised her as a calming voice of reason even during the most turbulent times. Trustee Robert Hodges – who is 29 years old – joked that Brown, 69, has served nearly as long as he’s been alive. He also appreciated her quiet wisdom. 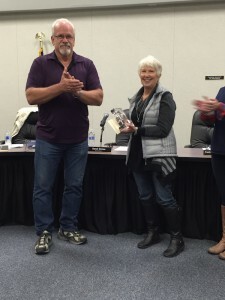 A contract with Storer Transportation Services of Modesto to take over transportation services was approved Thursday night by the Denair Unified School District Board of Trustees. Storer has furnished drivers to operate Denair’s buses on an emergency basis since the first of the year. The new contract will pay the company $75,400 for the remainder of this school year. The conditions of the deal require Storer to use and maintain Denair’s four buses and offer an equivalent position to the district’s former transportation supervisor. Denair needs two drivers each in the morning and afternoon to handle its routes. Repeated recruitment efforts last fall generated no qualified applicants. Instead, other district employees certified to drive a bus – a custodian, a utility worker and a transportation supervisor – had to take time away from their other duties. 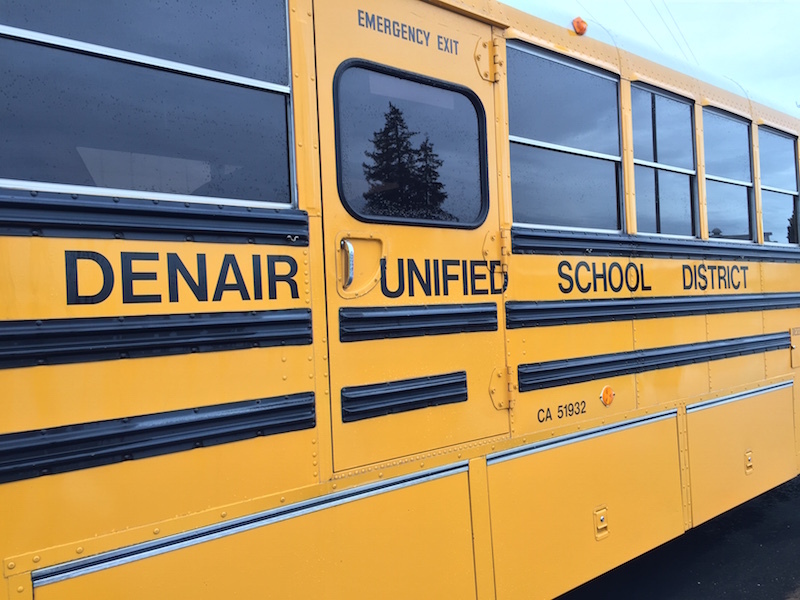 About 120 of Denair’s 1,300 elementary through high school students ride the bus daily. District officials said the outsourcing arrangement will be re-evaluated at the end of the school year. 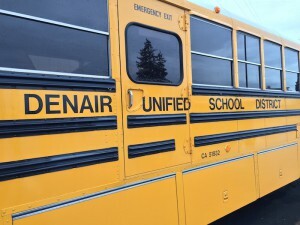 A company that has supplied bus drivers on an emergency basis since the first of the year is expected to be hired on a full-time basis at a special meeting of the Denair Unified School District board tonight. Denair needs two drivers each in the morning and afternoon to handle its routes. But repeated recruitment efforts last fall generated no qualified applicants. Instead, other district employees qualified to drive a bus – a custodian, a utility worker and a transportation supervisor – had to take time away from their other duties. Since the first of the year, Storer Transportation Services of Modesto has furnished drivers to operate Denair’s buses. At tonight’s meeting, trustees will consider whether to make that arrangement permanent through the end of this school year in May. Storer was the only bus company to respond after the school board requested bids in December. The proposed contract would pay Storer $75,400 for the remainder of this school year. The conditions of the deal require Storer to use and maintain Denair’s four buses and offer an equivalent position to the district’s former transportation supervisor. About 120 of Denair’s 1,300 elementary through high school students ride the bus daily, district officials said. Linda Covello, Denair’s chief business officer, said the outsourcing arrangement will be re-evaluated at the end of the school year. Tonight’s DUSD Board of Trustees meeting begins at 7 p.m. in the Leadership/Board Room, 3460 Lester Road, Denair. The full agenda is available on the district’s website.